I've always been fascinated by how people shelve their books, and I am an admitted judger of others' home libraries. In New York, I had such limited space that I could only keep one bookcase of books (I made a lot of trips to The Strand to sell off old titles), which were all alphabetized by author. 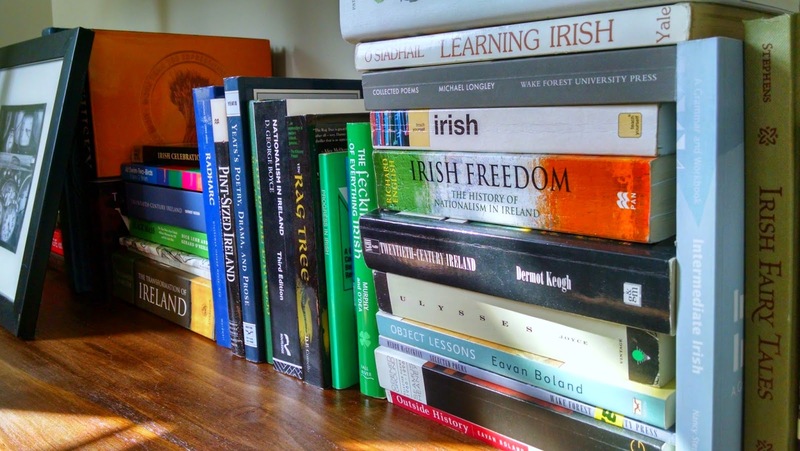 In our first house in Maryland, I had a few Billy bookcases and a few ladder bookcases generally broken out into fiction and non-fiction, with classics and Irish lit (we both had minors/concentrations in Irish Studies... we have a LOT of Irish lit books) pulled out. In our new house, we have a 12-foot wall in the dining room that was just crying out for bookshelves, so my amazing, incredible, bearded husband set out to build me industrial-style shelves with stained boards and black pipes. (A later post will follow on the actual building of the shelves, but right now he's actively avoiding all shelf-related speak... it was a bit of a frustrating process, complete with exploded spray paint can in the garage). The best part: I can finally unpack my books after they've been in storage for 18+ months. 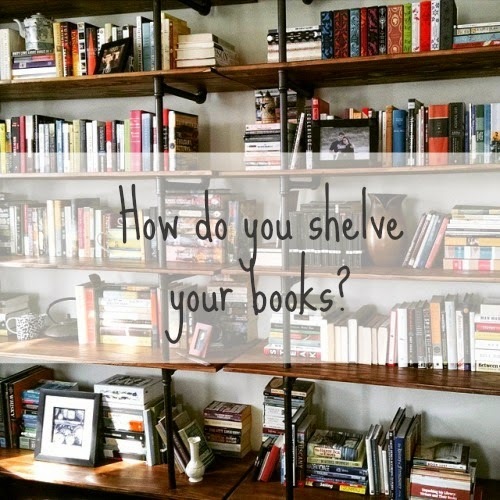 Which brings me to my question: how do you organize your shelves? I've heard of people who keep TBR shelves separate from their main books (Leah, I'm looking at you); I don't do this, though I do keep unpublished ARCs on a separate "to-do" shelf in my office. I know some people mix classics and fiction together, alpha by author; I also don't do this (sorry, but those Coralie Bickford Smith Penguins really look best when shelved all in a row, folks). Nonfiction is interesting in its opportunity for in-depth categorization: do you create a "history" shelf, or a "World War II history shelf"? Of course, it all depends on what you own. I settled on a basic fiction/classics/nonfiction system (the case on the left is all fiction, with Irish lit and Irish history sharing the bottom shelf; the case on the right is half classics and half non-fiction). Fiction is alpha by author, with a few exceptions where spacing didn't allow for that to work well (I'm looking particularly at that horizontal stack of Robert Jordan tomes). Mass markets, though, are pulled out and stacked on the ends of the shelves because I hate the way mass markets sit when shelved vertically. 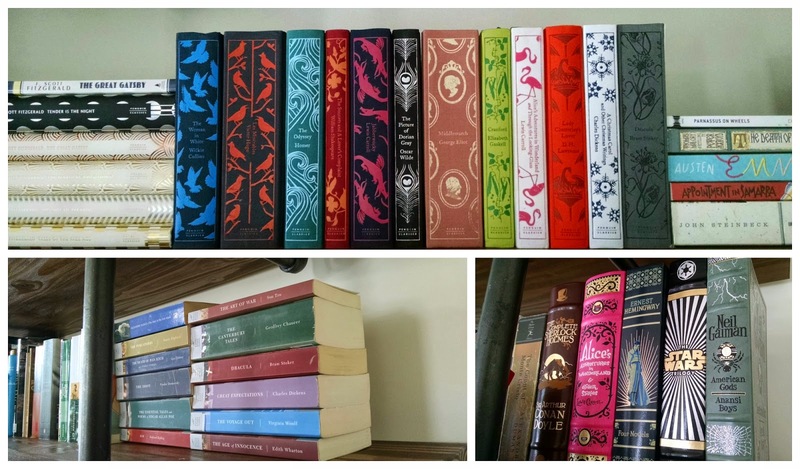 The classics are broken into series (see again: Coralie Bickford Smith editions, and those black-spine Penguins), and those not in series are alpha by author across one shelf. Antiquities (The Odyssey, The Illiad, The Aeneid, and--because where else do you shelf them?--Harrius Potter et Philisophi Lapis and my Latin-English dictionary) are pulled out into their own stack, and authors whose works we own major collections of (Shakespeare, Hemingway and Fitzgerald) are shelved independently based on shelf space. Poetry has its own (small) stack, though Irish poets are--you guessed it--with the Irish lit. History, essays and memoirs are grouped together and honestly not even alphabetized by author. Science books, albeit a small collection of them, are pulled out into their own section. Sailing books, self-help-esque (The Happiness Project, The Art of Happiness) are similarly separated. The Beard has his own mini-stack of trivia books on the main shelves (all his Star Wars books--of which there are many--are in his office downstairs). Upstairs on my dresser I keep a small stack of "books I'd like to read next," and for pure decorating purposes, I have a ladder bookshelf of brightly colored books in the master bedroom. Up in my office (I work from home) are a few shelves of business books (everything from financial management to non-profit foundation law to Bill Clinton's Giving) and a separate bookcase of upcoming ARCs and books on deadlines. I clear out that latter shelf every month based on pub date. The moral of this, of course, is not just that everyone shelves their books differently--of course based on their preferences and collections--but that no one will be able to find a book in this house except for me and maybe The Beard (maybe). Well that... and the fact that I have a LOT of books to read. How do you shelve your books? They got put on the shelves in the order in which they come out of the boxes. At one point they were shelved based on genre, similar to what you do, and then alpha by author, so they still vaguely have that order because they went into boxes in that order. But now, you get the occasional alphabetical run of S names, that will then veer dramatically to the Bs. The only separation I have now is a separate shelf for books that I'm most immediately interested in reading that I usually pull my next read from. I would like to put my books in some semblance of order again, but I need to do a lot of culling to be able to do that, which I'm totally putting off. I used to be very serious about how my books were arranged. Then I moved in with the man who became my husband and we had to deal with two libraries' worth of books instead of just one. All my books from before are arranged alpha by author for fiction and loosely by subject for nonfiction. 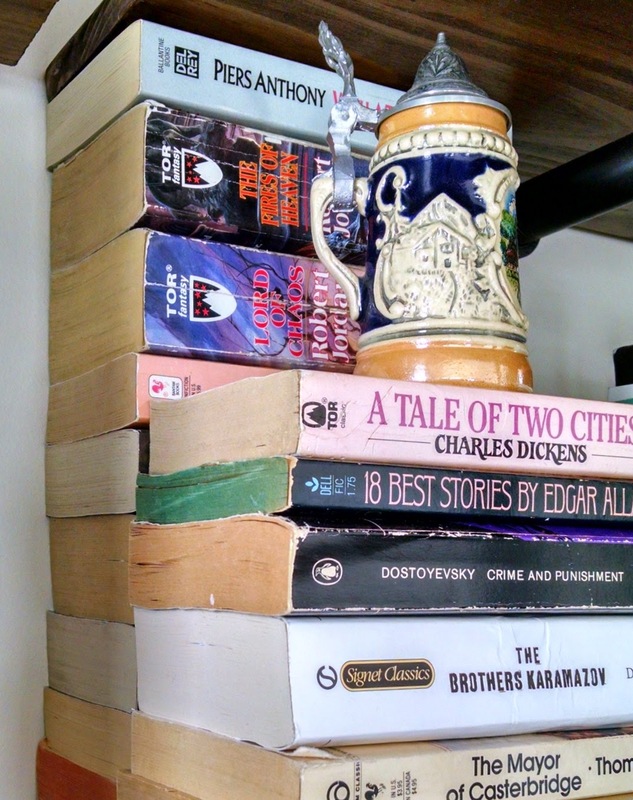 Most of the books accumulated since then are stacked against walls all over the house, or double-stacked on shelves. My ARCs aren't separated from my finished books, my fiction and nonfiction merge together, and my read and my TBR are as one. The only thing now that I keep separate is my growing section of Caribbeana: novels, nonfiction, travel lit and travel guides. I almost have enough for my own bookcase for them. Oh, I absolutely feel your pain on needing to cull before being able to organize. Even though I got rid of so many books before I put my stuff in storage, I still had two full boxes of books culled when unpacking. I guess 18 months of separation makes it easier to let go? A lot of this organization was easier because they were already sort of separated out by fiction/non-fiction/classics, so from there it was just a matter of stacking before shelving. But even that took a day or two of sorting and organization. 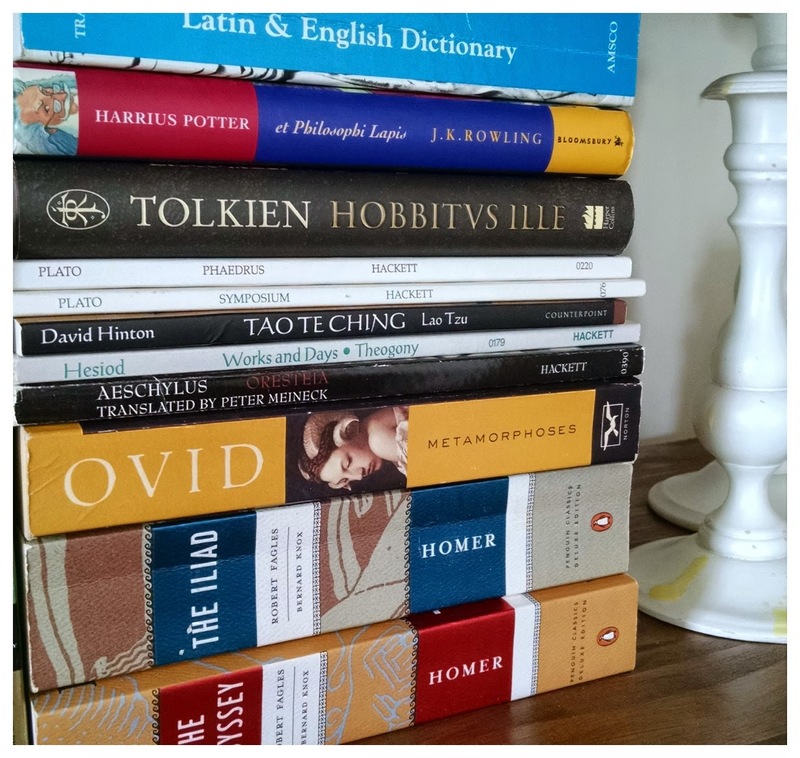 I like the idea of keeping a separate shelf of "want to read soon"--I have a mini-stack on my nightstand of those, but could stand to expand beyond a small stack given the number of books that qualify for that pile right now. We also have a small cubby-style bookshelf in the bedroom, where I tend to store books I have culled until I get around to selling/donating them. Great question. I'm very particular. On my main bookshelf: All autographed books together. Current year releases together. Then Canadian books. Then fiction. Then Classics. Then Non-Fiction. My 2nd bookshelf has Christian books together, then my collection of Oxford Classics, then un-read books. 3rd, smaller bookshelf is all Chick Lit. I also have books everywhere. I have a stack on my nightstand, some on my desk, and, I'm not sure why but there seems to be a growing collection in the trunk of my car? I think it started as books that were culled from the library and I planned to take home one time and since then it has grown. Well, if I get stranded I will never be bored. That is for sure. Thanks for sharing my link :) I was all excited to explain how I shelve my books, but I guess that would be redundant now, haha ;) Anyway, that bookshelf your husband built is AH-mazing! I love it so much. And reading about your book organization was fascinating. When my books were shelved alphabetically by author, I mixed all genres - I just don't think I own enough non-fiction to split them up. Although, I guess even one shelf worth of non-fiction would still be "enough". As much as I love my colour-coded bookshelves, I cringed when I had to split up books by the same author and books of a series. The books in Sully's nursery are also colour coded, but the effect isn't as great because he doesn't have too many books yet. Oh yeah, I've got a lot of organizing system + wherever things happen to fit going on. Sharing bookshelf space can be tricky! I have an odd collection starting in my car, too...maybe because I didn't have anywhere to put them inside? Oh, I like grouping the autographed copies. Don't think I've seen anyone else take that approach, but it definitely prevents an autographed copy from accidentally getting culled somehow! I think it's so interesting that you separate your TBR books from the rest. It makes so much sense! But then I realize how quickly I get rid of (sell or donate or just lend and never see again) books I've already read, and realize my non-TBR shelf would be teensy. And those Norton anthologies are a bear, right? My husband has a shocking number (English major) that he won't part with, so I tucked them up top out of my reach next to three (3!) collected works of Shakespeare. Awesome! I somehow hadn't seen this feature on his blog but I love it. I love seeing how people organize their books. For me TBRs must be shelved separately. Usually in various piles around my house. Fiction and non- fiction must be separate as well. And my CanLit and South Asian Lit are also separate. Now that I live in the UK i've been debating about separating the BritLit out as well. Decisions!! Anyways, great post. Love your new book shelves. Wish I could come visit and just browse them for a while. Our house has both a family room and a living room, which I think is unnecessary, so now the living room is a library. 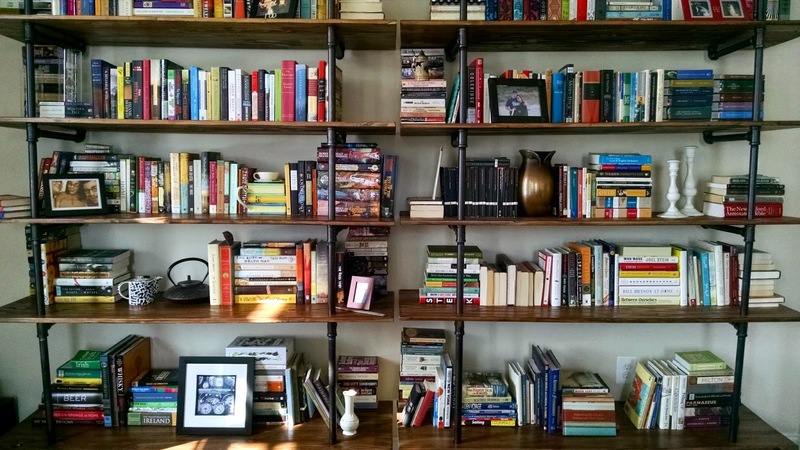 My husband, too, built a huge floor-to-ceiling bookcase against one entire wall. I mix fiction, nonfiction, and classic books together and shelve by author name, except reference books, which are on their own shelf, and books on animal care and cleaning, which also have their own shelf . None of my to-read books are shelved; they are in piles on tables in the library. I'd love to spy over your shelf of Caribbeana. I still have the list of suggestions you gave me last summer (I think it was last summer?) but haven't been reading much of them... too cold! I feel your pain on the stacks of books all over the house! Thank you! I lucked out on the bookshelf-building husband. I can't imagine storing my books for 5 years! I admire your patience. Leah (Books Speak Volumes) said the same thing about TBR books! Mine are all mixed in with everything else. I like the idea of separating by CanLit and South Asian Lit (and BritLit!) though. How do you know what you're 'supposed' to be reading if it isn't shelved separately? Yeah, we looked at a few houses with family + living rooms, and I was never sure how we'd use them both (we don't have kids). I'd love to have a designated library room, though! You're the third person who says they keep their TBR books outside of the main collection, too, which I'd never even thought of. Interesting question... I don't know, really. I guess I just pick randomly? Although ARCs with upcoming pub dates ARE separated, so that helps in terms of deadline-driven selections. I could tell you about my shelves...how organized they are, etc. But then you'd laugh at me and my lies ;) I do have a system of sorts but no one would be able to figure it out because it's not a very good one, lol. Yours are gorgeous! I absolutely love your new bookshelves! In theory, I sort my books through a convoluted system of type of books and author, but it also has to look good so it's kind of a fluid system. At the moment, I have such limited space in my apartment, that the books are organized to get the maximum number of books to fit on two shelves. Regrettably, most of my books are in boxes in a storage room on the other side of the world. I cannot wait until I move again. First thing on the list (after finding a job and somewhere to live) is to have all the books shipped to me. Good grief those are gorgeous! First up, I appreciate that you called your husband "The Beard" and second, those are lovely bookshelves! Well done, even if he doesn't wish to speak of them at the moment. I love how bookshelves organized by color look but I fear any sort of method I could try would fall apart as my organization style the last couple years has been "Wherever this will fit"
I've been playing with this dilemma for over a decade, and I still haven't figured it out. I completely understand on the triple-stacking... my organization is a mix of actually organized and things stuck where they fit. Plus, every time I acquire new books (or, less common, get rid of old books), I end up having to adjust the whole shelf. Haha, these won't be organized forever. They're just neat right now because I *just* unpacked the boxes! And thank you! Thank you! I'm pretty excited about them myself. And I feel your pain on the books in storage... hopefully you can be reunited with them soon! Ha, well, he has a crazy beard so it seems only fitting, really. And I love the way bookshelves by color LOOK, but I think it would make me crazy looking for books and decided where to shelve new books every time I bought something. I love your shelves! Industrial style shelves are my favorite. My current apartment in Brooklyn came with built in bookshelves in the living room, which completely delighted me. I still needed two giant Billy cases in the bedroom though to store everything. I did a post years ago when I lived in Hoboken with photos of my shelves, but I think I'm overdue for a new post that features my shelves now! Your shelves are great! I have two Ikea bookcases where my books are stored along with other stuff.